Posted October 12, 2017 by Bob and Jane Kinzie & filed under Backup Generators. As mentioned in our previous blog post, one of the most beneficial features on your backup generator is the self-testing feature. Here’s a breakdown of how the test works. Any problem with your standby generator is diagnosed through an indoor remote monitor during this weekly test. More modern Cummins units have the ability to transmit data to a computer or smart phone. 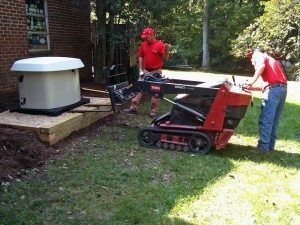 The data transmitted helps determine whether your standby generator is in need of any repair work, so when you call the maintenance team, they are already up to date on your issue. Make sure you are checking this test weekly, as on-going generator maintenance is necessary to ensure your generator is in secure working order during unexpected power outage situations. Newer generators are relatively quiet while conducting this 10-15 minute test. Expect to hear a low rumble-like noise that is less of a nuisance than in older models. We suggest investing in a generator with a quiet mode so that you are not disrupting the surrounding homes around your neighborhood. Many neighborhoods abide by strict noise codes throughout the daytime and nighttime. The self-testing feature on a backup generator identifies a host of potential problems, including but not limited to over crank in cold weather if the generator does not include a heat kit, lack of fuel, or faulty fuel feed. These problems are easy to identify over the phone when you call the maintenance team. More people are relying on backup home generators because of their modern capabilities. If you are interested in learning more about the Cummins backup generator models we use, don’t hesitate to contact us today.